The Yellow and Gray leads are the Ringer Section. You have to have a capacitor in series with the ringer, or it will cause the line to lock in at Central and make a busy signal. Also, without the capacitor, the ringer will draw a lot of current and will prevent other phones on the line from ringing. 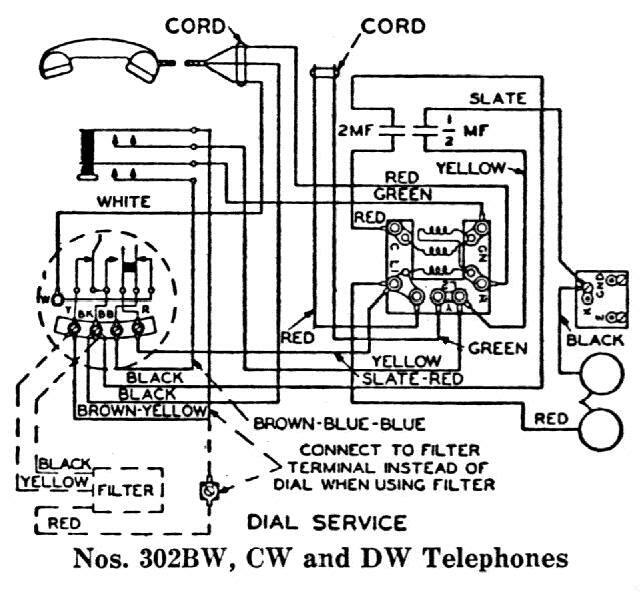 So, when you look at a typical #302 telephone, you will find that the yellow wire is hooked to "L2," and the gray wire to "K." Normally, the black ringer wire is on "K" and the red ringer wire is hooked to "L1." The other section of the capacitor is the "talk" circuit, or "secondary." The induction coil boosts the speech voltage and sends it out on the telephone line. The receiver doesn't work very well if line voltage is present on it, so there has to be a means of removing direct-current and letting speech sounds through (alternating-current). This is where the capacitor comes in. If you look, the black capacitor wire is attached to Line Two via the transmitter (terminal "BK") in a #302. From "BK" you can readily trace the circuit to "Y" in the dial and through the brown/yellow switch wire to the solid yellow switch wire which is hooked to "L2." The other wire from this capacitor section is red and is hooked to "C" on the induction coil. "C" is the end of what is called the Secondary Winding. If you take the wire off of "|C" the receiver will still operate, but very inefficiently because it will only be hooked up via what is called the Anti-Sidetone winding. You will note in older phones that there is only one condenser that shares duty with the ringer and the induction coil. This is called a Side-Tone circuit and if you disconnect the condenser in these older phones, the receiver will not work. This is why older phones have only a two-wire capacitor and newer, Anti-Sidetone phones have a 4-wire capacitor.